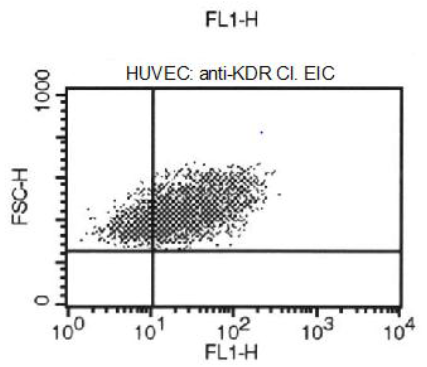 Mouse anti Human CD309 / VEGFR-2 / Flk-1 KDREIC. 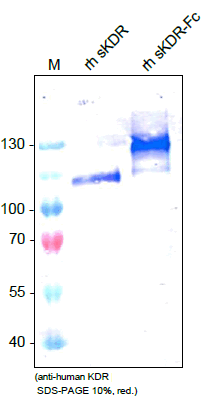 Product is tested for Western blot / Immunoblot, Frozen Sections, Enzyme Immunoassay, Flow Cytometry. 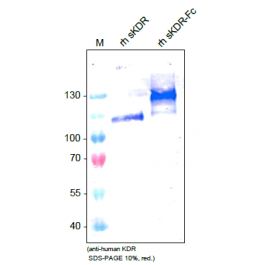 Flow Cytometry analysis and cell sorting: 3-15 µg/ml. Ebos JM, Lee CR, Bogdanovic E, Alami J, Van Slyke P, Francia G, et al. Vascular endothelial growth factor-mediated decrease in plasma soluble vascular endothelial growth factor receptor-2 levels as a surrogate biomarker for tumor growth. Cancer Res. 2008 Jan 15;68(2):521-9. doi: 10.1158/0008-5472.CAN-07-3217. PubMed PMID: 18199548. Restore in sterile water to 1.0 mg/ml. 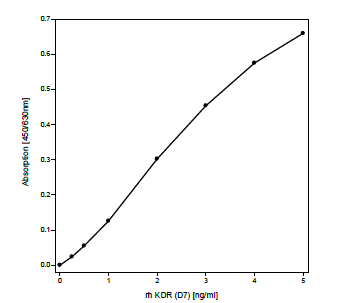 The antibody will detect native VEGFR-2/KDR in ELISA experiments and on the surface of different Human cell types.